Now is the time to become an expert at time and project management; as well as how to balance your work and real lives. You’d think working full-time and developing your own business in the late night hours would be worse but I’m here to tell you- it’s not. When you work for yourself it becomes that much harder to leave “work” at “work”. Save three times as much money as you think you’ll need. Campaigns will die, you’ll need a new water heater- whatever, something will happen. Read the E-Myth Revisited. Pay attention to everything he says about “having an Entrepreneurial Seizure”. If you have ADD read this Cliff’s Notes version instead. I’m not kidding, read that before you quit anything. I wish I had. Write out a business plan. Trite, I know, but if you don’t have a business you can write a plan about – you don’t have a business. Assemble your support services team now; CPA, attorneys, etc. Make sure you have health insurance covered for you and your family, if applicable, before you leave. Lower your expenses as much as possible. “Most young people who take a business from four to ten million feel they deserve a watch and a car and a cool apartment as rewards for their savviness and hard work. Get over that. You come last. Before you invest in yourself, you have to invest in your long term future. That means your profits should funnel right back into your research, your content, and your staff if you have any.” –Gary Vaynerchuck in Crush It, pp. 92. Create a work space and leave work in it. Close the door and be with your family or friends when your work is “done”. Don’t steal from your company. The first job I landed after college was at a small boutique intellectual property law firm that enforced (what I thought at the time were excessively) strict rules. Among them internet access was restricted because surfing the internet and taking personal phone calls was akin to stealing from the firm (they are paying you for your time, you depriving them of your time is tantamount to stealing). I, personally, wasted way too much time worrying about what other people were up to, goofing off on forums, twitter and blogs that could have been put to profitable use. The time you waste today will cost you twice as much to regain tomorrow. Figure out what your most profitable action is and do it every day. Focus on efficiency of work over volume. You will, eventually, reach the point of “grow or die”. You’ll either need to commit to remaining “x” big and turning away opportunities/ clients/ campaigns or begin taking on staff in order to scale your operation. 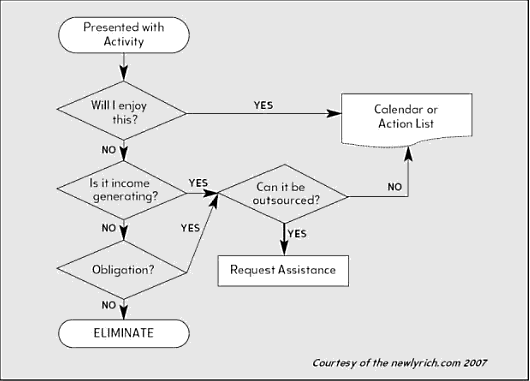 A tool I’ve found useful to gauge what should or should not be done by you is this flow chart found in The 4 Hour Work Week. Make sure you’re eating well and exercising. You may be comfortable with spending hours online but your body is not. Any advice from the crowd? If you have productivity notes, business hacks, or lessons learned- I’d love to hear them. This has got to be the hardest part. I have an office but when things are going well it’s so hard not dash off to a computer or iphone to check stats. This is the part I’ve struggled with most. Having holidays in a wirelessless location has been great for detoxing. Thanks for sharing and, btw, thanks for this post: Top 10 Super Affiliate Rules. Your blog continues to pump out great, relevant affiliate marketing content. On ‘closing the door’ I feel the same way, it is the most difficult task. In fact- I started investigating how to make money online because I loved spending my summers fishing in Bristol Bay Alaska so much (on a salmon gillnetter out of Dillingham) but knew that a 9-5 wouldn’t support me leaving for 4-6 weeks every year. Now, when I have returned, I find being forcibly detached from the world because I’m in the middle of the Bay is the most restorative thing I can do; mentally. I owe a tremendous debt of gratitude to the friends and family who have been patient with me during the last 2 years. This is the rule I’ve been most negligent in keeping, but the one I most want to make sure I get right going forward. Just stopped by your blog after seeing one (of many) tweets from Shane. Finally at the computer when I checked Twitter and I completely agree with what you’ve shared. I haven’t been strict on shutting the door to work though because I’ve found that I actually tend to get through more emails when I’m on my iPhone in another room. Perhaps that’s because of the shorten length of responses though. In any case, I’m nearing day 400 myself and I’m personally just happy to be making more money than my old day job. I completely agree with the point you included from Gary. I just sold a website recently for a big chunk of change and as much as I’d like to buy a second car in cash for my wife (so I can actually go places when I’m at home working all day) it makes much more sense to reinvest that money into other projects that have the potential to be much bigger hits. Awesome! Gotta agree with Mr. Green there. I’ll be watching a movie with my GF, then take a bathroom break, but take a short detour to the PC to check stats. Just awful, but ahg… I need my monies! These are great tips, thanks. I recently left my job and can use all the advice I can get. The one part I have down is eating well and exercising as that is what my “job” is now. Far better to own the racecourse then a race horse.